Pozole (from Spanish pozole, which means "foamy") is a traditional pre-Columbian soup or stew from Mexico. It is made from nixtamalized cacahuazintle corn, with meat, usually pork, chicken, turkey, pork rinds, sardine, chili pepper, and other seasonings and garnish. Vegetarian and vegan versions also exist. Left: Pozole soup served in clay bowl. After colonization by the Spaniards, the ingredients of pozole changed, but the staple, corn, remained. It is a typical dish in various states such as Michoacán, Guerrero, Jalisco, Morelos, México and Distrito Federal. 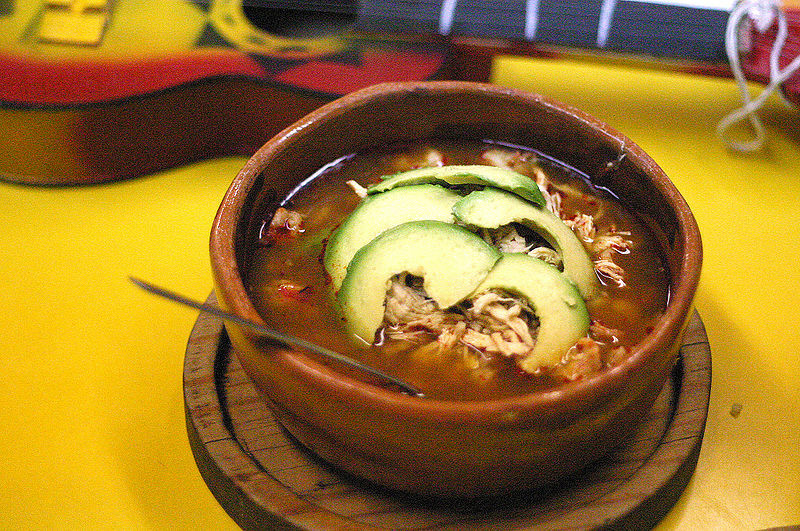 Pozole is often served in Mexican restaurants in the American Southwest. In many places it is considered a delicacy and is not an everyday food. In pre-Columbian times the soup had ritual significance. Since corn was a sacred plant for the Mexicans and other inhabitants of Mexico, pozole was made to be consumed on special events. The conjunction of corn and meat in a single dish is of particular interest to scholars because the ancient Mexicans believed that the gods made humans out of cornmeal dough. In these special occasions, the meat used to cook the pozole was human. After the prisoners were killed by tearing their hearts out in a ritual sacrifice, the rest of the body was chopped and cooked with corn, the meal was shared among the whole community as an act of religious communion. After the conquest, when cannibalism was banned, pork became the staple meat.